Tired of lounging on the beach? Want to stretch your legs and take in some stunning views? 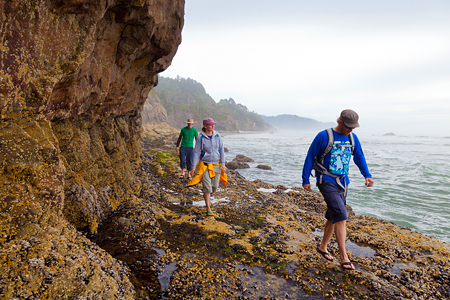 Explore the wild side of the Oregon Coast with a seaside hike, where temperate weather and offshore breezes will keep you cool, even when you’re trekking. Simply put, Ecola State Park is one of the most scenic spots along the Oregon Coast. For a short day hike that reveals all its breathtaking beauty, hop on the Oregon Coast Trail at the north side of the parking area, and head to Indian Beach. The dirt trail winds through a spruce and hemlock forest (welcome shade on a warm day), and offers fantastic views over the Pacific before reaching Indian Beach, a picturesque cove and popular surf spot. Watch surfers ride the waves, gaze at Tillamook Rock Lighthouse a mile offshore, or explore the tide pools as you rest up for the return trip. Make your way from Cannon Beach to Hug Point, so named for the need to “hug” the point in order to round it. Note: This hike can only be completed successfully at low tide as sections are under water at high tide. Wear good shoes to hop slippery stones, and be prepared to get a little wet. Along the way you’ll see multi-hued sea stars and spiky anemones clinging to the rocks. To round Hug Point you’ll walk a primitive roadway carved from the sandstone headland, which stagecoaches and early autos used to travel the beach “highway.” At trail’s end, you’ll find a surprising waterfall cascading down to the beach. The return trip to Cannon Beach yields wide-open views of Haystack Rock. Local lore has it that Spanish sailors buried treasure on Neahkahnie Mountain in the early 1700s. Today, the treasure lies atop the 1,600-foot peak, where you’ll find stunning panoramic ocean views. The switchback trail rises about 800 feet from bottom to top, winding through a dense coastal forest that opens to periodic ocean views and wildflower meadows. When you reach the top, you’ll find a dual summit with scramble trails to either peak. While you might settle on a favorite, we guarantee that both offer amazing views.